The Independent Commission Against Corruption (ICAC) has found former council planner Beth Morgan and her ex-lover, developer Frank Vellar, engaged in corrupt conduct. Ms Morgan slept with and received bribes from Mr Vellar and other developers while assessing their applications. She approved Mr Vellar's $100 million Quattro development during their affair. The ICAC says the pair's actions could constitute criminal offences punishable by jail. It has also recommended Planning Minister Frank Sartor suspend the consent granted for the Quattro development, which it says grossly exceeded council standards. Mr Sartor says consent has already been suspended until June 18. "If I have to exercise my powers to suspend the consent for another six months, then I will do so," he said. "I will have no hesitation in taking ICAC's advice on board." Premier Morris Iemma acted swiftly on a previous recommendation to sack Wollongong Council in March. The Greens say the ICAC investigation demonstrates the need for a wider look at corruption in the NSW planning process. ICAC Commissioner Jerrold Cripps QC called for prompt action in a statement earlier today. He said Ms Morgan failed to properly asses the Quattro development application as part of a scheme with Mr Vellar. 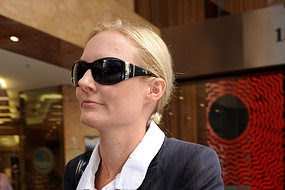 The ICAC said Mr Vellar requested Ms Morgan be assigned to assess the application when she returned from maternity leave in March 2004. It said she began a sexual relationship with Mr Vellar two months later. The watchdog said he gave the planner gifts and benefits worth thousands of dollars, including cash, holidays and home appliances. The findings are included in the second report released as part of ICAC's investigation of 14 people over Wollongong Council's planning processes. The first report recommended the council be sacked in March, after 11 days of evidence about breaches of the council code of conduct on planning matters. The New South Wales Greens have called for a royal commission into state planning decisions, following a number of allegations the Government overrode advice to deliver huge windfalls to ALP donor.